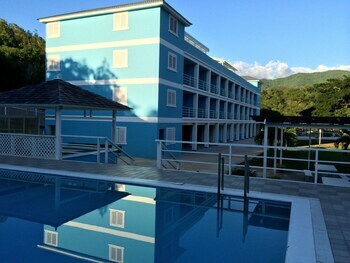 With a stay at Three Finger Jack Hotel in Eleven Mile, you'll be within the vicinity of Blue Mountains and Institute of Jamaica. Featured amenities include dry cleaning/laundry services, luggage storage, and laundry facilities. A roundtrip airport shuttle is provided for a surcharge (available 24 hours), and free self parking is available onsite. When you stay at Cindy Villa in Runaway Bay, you'll be near the beach and close to Cardiff Hall Beach and Green Grotto Caves. Free self parking is available onsite.